But back to Grandpa. He passed away when I was only 13 years old. But one of my earliest and most treasured memories of him comes from a visit to Grandma and Grandpa’s house, in North Carolina where they retired. Grandma cooked us a big breakfast of fried eggs over easy, buttery grits, and slices of toast. Grandpa put his toast aside, picked up his knife and fork, and cut up his eggs right into his grits, stirring the yolks up into the grits and making a huge mess of his breakfast! That’s the way he always ate his grits and eggs, and even now, I do the same from time to time, just to remind me of him. But today it was scrambled eggs with grits. 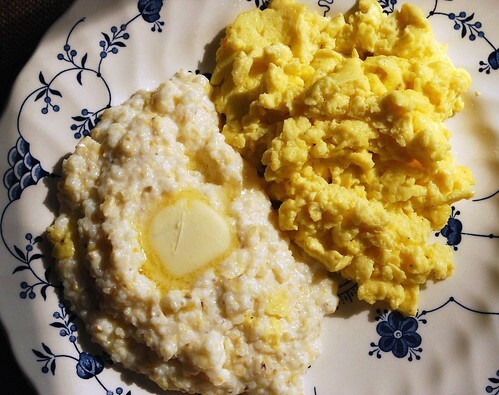 Don’t do the instant grits – find some that you actually have to cook – the flavor and texture is to die for. We get ours from a local mill just up the way in Helen, Georgia – the Nora Mill Granary Grist Mill & Country Store. It is a really fun place, a truly authentic mill with a great store right on the Chattahoochee River. Their white speckled grits are my favorite. Wow, you can order their stuff online, too – who knew? 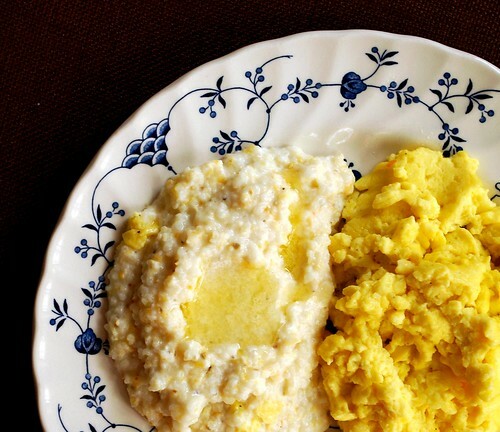 Now remember- grits aren’t just for breakfast. Try serving grilled fish on top of a bed of creamy grits, or shrimp and sausage baked in grit-cakes. Delish. For the grits, combine the grits, milk, and salt in a medium sauce pan. Bring to a boil over medium-high heat. Lower the heat and continue to simmer the grits, covered, for about 20 minutes. Serve with a thin tab of butter on top. Enjoy!